2035 A.D. After the 2nd American Civil War Jack Pasternak, a laid-back California doctor, receives a garbled distress call from his fiancée in Maryland before her transmissions stop altogether. Unfortunately for Jack, citizens of the Blue States are no longer allowed to cross Red America. He is faced with an impossible choice: ignore his lover’s peril or risk his own life and sanity by venturing into the dark heart of The Red States. When the armies of the Mexican Reconquista come marching into Los Angeles, Jack’s hand is forced and he heads east in an old-fashioned gas guzzling car. Another roaring success! This book is very different to the other books that Kozeniewski has released so far but he still manages to fill it with his trademark wit and dry humour. 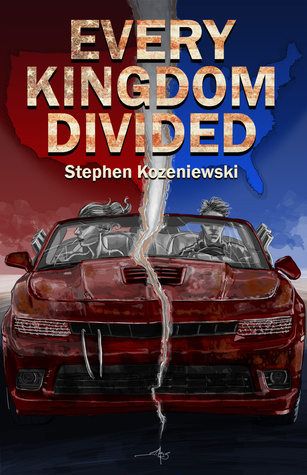 The story takes place in a dystopian version of America, the states have been split into different factions, the most predominant of which are Red, Blue, White and Mexican. They all have extremist views on how the country should be run and aren’t afraid of using heavy artillery to show it. Civilians are drawn in as the conflict goes on around them, everyone seems to switch sides as often as necessary to ensure their own survival and it’s altogether a huge mess just as you’d expect if the United States went rogue. What I love most about this book is that it isn’t really about the politics of the war but about the war itself, the soldiers and the civilians trying to survive this war. The battle scenes are expertly written, adding just the right amount of detail to proceeding to make it realistic without making it gratuitously gory and depressing. This is a story about survival after all! Of course, there’s an almost completely unromantic Romeo and Juliet storyline running throughout the book – a Blue man and a Red woman find themselves falling in love while facing war, religious fanatics and minefields. Unromantic romance is my favourite kind, especially the grudging kind! The story bounces backwards and forwards, which was an interesting style. From Jack and his current situation, to his recounting everything that’s happened to him up to this point and then finally joining up together to end the book. The chapters alternated in perspective and took a little getting used to as they were quite short but I soon got into the swing of it. The ending of this book was perfect and rather beautiful coming from a man who specialises in writing about nasty things in jars, it struck a chord with me. Of the four books I’ve read so far by this author, I may go as far as to say that it’s my favourite – if Steve Rimpici narrates it for an audiobook then it will be no contest.